Growing to Serve… Serving to Grow. Youth & Family Ministries This area involves several different ministries that work together to help families and individuals of all ages grow together in their faith. 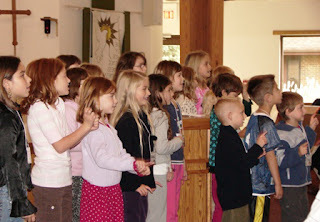 Christian education includes spiritual-growth programs for all ages. For children, opportunities include Faith Quest Sunday school, Vacation Bible School, introductory Bible classes, and first Communion. Adults are encouraged to participate in a variety of Bible studies and small groups offered throughout the week. Youth ministry leaders work together to help guide our older children and teens through activities designed to excite them about Jesus and challenge them to make Him the center of their daily lives. Programming includes Midweek MANIA for 5th-6th graders, Confirmation, small groups, Bible studies for youth in 7th grade through high school, and the high school youth group. Small group ministry is an effective way to receive support, offer support, learn, serve, and grow in our efforts to become more like Christ. Some of our existing small groups include: men’s Bible study, women’s small group Bible study, other small group Bible studies, youth Bible studies, knitting group, quilters group, and book club. This team seeks to glorify God by maintaining and growing the programs that sustain the worship life of Living Lord Lutheran Church. The goal is to continue, improve, and develop new styles of meaningful, varied, and uplifting worship services through both behind-the-scenes work and more visible contributions. Subgroups of this team include the altar guild; ushers; worship facilitators; liturgical assistants; readers; sound system team; multimedia team, drama performers; and choirs, instrumentalists, and special music. The purpose of this ministry is to equip our members to help one another in times of need. Care ministers reach out to members and friends of Living Lord through care cards, the food ministry team, hospital calls, prayer ministries, and more. The goal of our social ministries is to involve members of the congregation in ministering to the needs of others. Some of this team’s activities include blood drives, food, clothing, and blanket drives, holiday food and gift collections, quilting and knitting/crocheting ministries, and other community-outreach initiatives such as leading the Northwest DuPage United CROP Walk for Hunger and supporting several area food pantries. As Christians, our job is to reach out to our members, friends, and neighbors and invite them into a relationship with Christ. Living Lord has a variety of ministries designed to increase member involvement and connect with others who may not know Jesus. These ministries include the Bread of Life program (for visitors), Living Lord orientation classes (for newly joining members), other Bible studies and small-group opportunities, community-oriented programs such as Preschool and Vacation Bible School, and participation in Bartlett-area community events. Fellowship time is important at Living Lord. Activities and events that bring our church family together include Sunday morning coffee service, Donut Sundays, Lenten Soup Suppers, ice cream socials, sports games and other outings, and church picnics. 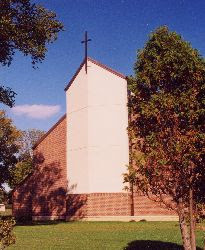 The main function of this group is to ensure the quality of the Living Lord Lutheran Church Preschool program. This is accomplished by maintaining a strong teaching staff and continuing the policies of ethical responsibility and financial integrity, which have been the trademark of this ministry and the reason for its success. The Preschool Board consists of the following appointed officers: president, vice president, treasurer, and secretary, as well as other volunteer positions. Please contact the Preschool director, at (630) 830-7158, for more information on opportunities to serve on the Preschool Board. The President is the legal officer of the church; he or she presides over the Church Council. The Vice President assumes the responsibility of the president in his or her absence and recruits the annual Nominating Team, which seeks candidates to replace exiting Council members. The Treasurer prepares monthly and year-to-date financial statements and all related tax reports. This position requires knowledge of accounting. The Secretary attends all Council meetings, records minutes, and keeps all ministry reports. Members-at-Large attend all Council meetings and help the executive officers and pastors lead the direction of the congregation. This group is responsible for interviewing and hiring lay staff, evaluating staff performance, updating the employee handbook, maintaining personnel files, and coordinating time cards, records, and policies. The team’s subgroup, called the Mutual Ministry Team, helps communicate congregational needs to staff and supports staff in their ministry. The Property Team is responsible for the ongoing maintenance and operations of the church building and its property. This team plans cleanup and other work days throughout the year and encourages participation by all members who can lend a hand. This team works to encourage members to become good stewards of their time, talents, and treasure to support the ministries of Living Lord Church. This group coordinates the annual stewardship drive, an important step in the budgetary process, and facilitates volunteer help through the Service Opportunities booklet. Through this tool, members and friends indicate how they would like to share their God-given spiritual gifts with the congregation and our surrounding community.